We look forward to partnering with you in the care of your pet. We strive to provide you with a variety of care options, and to support you through decision making at every stage of your pets life. 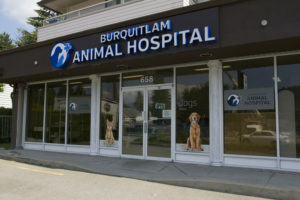 When you arrive, you will be greeted by our friendly staff and find comfortable, and separate waiting areas for dogs and cats. When it is time for your appointment, our staff will weigh your pet and show you into one of our exam rooms. Our office staff are extremely knowledgeable and are happy to help you with pet foods, weight loss programs, etc. They can also help you with flea medications, over the counter supplements and prescription food diets. In the rare instance that an emergency occurs at the same time as your appointment, our doctors may have to treat and stabilize this patient before they see you. We appreciate your understanding and we will ensure that the doctor sees you and your pet as soon as possible. A preventative health check once a year will ensure your furry friend is vaccinated and de-wormed appropriately. As your dog gets older ensuring their teeth and heart are healthy your pet. Vaccinations keep your pet healthy, and guard against potentially lethal illnesses.